All of our Mac's also run VMWare with Win7 . . I guess that still makes us mac mainly. Mac of course. Machines should work for us, not the other way around. Depends on what I'm doing. I have 2 main machines in the house right now. One macbook air (which I'm on now) for general computing. A windows desktop for solid modeling and other assorted design work that needs multiple monitors, a solid video card, and gobs of memory. Then I have a red headed linux stepchild laptop running archlinux; it was fun piecing together the install to get exactly what I wanted. Still, in the end I use computers as a tool for my hobbies, linux is for folks who's computer IS the hobby. It doesn't get used much except when I want to monkey around in linux. Funny. These brand-loyalty polls just crack me up. Stereotypical graphic artists are Mac all the way but my wife (another graphic artist) hates them. I'm a hardware enthusiast (used to overclock everything) so Windows all the way baby. I'm a software developer where all the systems I work on at work are linux based, so it's much easier for me to do my job with a linux desktop. At home, my computers are ancient and "resource limited" so I tend to run linux as it's more resource efficient. That said, when I started working with APM, I started with Mission Planner which is Windows only. Rather than run it in a virtual machine, I decided to just setup a dual boot on my main computer which is an old Dell laptop. The computer that actually drives my home network is a Raspberry Pi (original model A) running archlinux. My computer at work runs Gentoo Linux. I am a programmer who primarily works in Windows. I do not like Mac because of the closed nature of the hardware: you cannot legally run the Mac OS on non-Apple hardware. The openness of Windows and Linux has help lower the costs of computers, including Macs. I personally do not think that Macs have any features that make them worth the extra cost but obviously many disagree. Almost exclusively RH Linux at work for my Oracle RAC DBs. We migrated from Solaris a couple of years ago. I'm a recovering Software Engineer and I still enjoy writing Perl code. I run SSH, Office and other tools on a Win 7 laptop at work. v8.1 on my Surface Pro 3. I think my company is going to do a BYOP soon and I can drop the iPhone which is getting long in the tooth and really slow. I too am a software developer... Windows and linux at work and at home. I only keep windows around at home so my wife does not have to call me every five minutes trying to find an application. I tried going the all linux route at home but all that caused was confusion. I do not like Mac because of the closed nature of the hardware: you cannot legally run the Mac OS on non-Apple hardware. It's not the hardware that is closed. You can run Windows and Linux on Apple machines just as you can run OSX. There is a reason for that OSX closedness: The hardware that needs to be supported is fairly limited compared to Windows based PCs. Also Apple doesn't use BIOS, but UEFI. I have given up on Windows a very long time ago, but kept a machine to play games. For quite some years I used Linux exclusively - I've set up my first Linux somewhat around 1994/1995(!). A while ago I decided to look into Macs and really started to like the hardware and for what it is to me: A Unix system that just works for everything I need it for. Sometimes I think i got too old to keep fiddling with drivers and sourcecode to get desktopp Linux running the way I want. So today it's Linux on servers and OSX on my Macbook. It's not the hardware that is closed. You can run Windows and Linux on Apple machines just as you can run OSX. That sounds closed to me, especially when compared to other operating systems that work on a wide range of hardware. There is a reason for that OSX closedness: The hardware that needs to be supported is fairly limited compared to Windows based PCs. That sounds like a reason for the system to be less expensive than a comparable Windows system due to lower development and support costs. Yet, they charge more. Why? However, if we are not careful, this is likely to become a Mac vs PC thread which I question if that is something that should be debated here. So, I think we should stop here with a simple "Agree to Disagree". 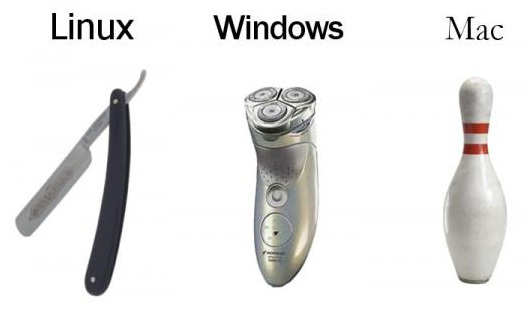 I use Windows. I love the idea of Linux, but I like using a computer more than tweaking one. To be more specific my laptop has Windows 7 and my desktop has Windows XP. My laptop is for internet and games. I accept the fact that it's prone to spyware and viruses. (I do have a good anti-virus, but they aren't 100%.) My desktop is for saving photos and music. Because my desktop is for storing the stuff I never want to lose, it doesn't even know what the internet is. I've had my desktop since 2004. It's so old I had to replace the watch battery in the motherboard a year or two ago. It does what it needs to do. Sometimes I think i got too old to keep fiddling with drivers and sourcecode to get desktopp Linux running the way I want. Man, linux in the 90's put a hurting on you, didn't it?